Over the weekend I met up with a fellow blogger friend Mark Powers of Powers Percussion (go check his blog out). We took a drive out to King Estate winery and had a wonderful lunch and enjoyed some good wine. The weather was a bit stormy but that just added some character to the day. Mark and I talked a bit about our plans for the future and I found him to be a great guy. He is working on a new project called The Donating Drummer. It’s all about giving back to the community and I think it is just a fantastic idea. Here’s how it will work: every month readers will submit an application answering the question “What would you do with $X amount of money?” Then Mark will donate his earnings from one gig, performance or recording session that month to fund his favorite submission. I find this to be a fantastic and creative idea and I’m looking forward to seeing the submissions once this thing kicks off in December. So if you have a good idea head on over to The Donating Drummer and submit it. You just might win the money to make your idea a reality. After we had enjoyed a great lunch we headed outside. I noticed on some wooden tables that the rain water had beaded up. It made for a really cool shot which you can see here. 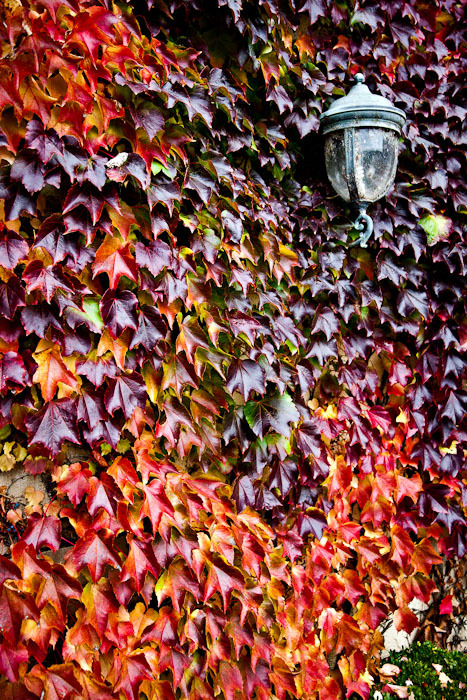 As we made our way around to the side of the winery I spotted this vine colored wall. The leaves on the vine were changing colors and it just made for a really neat image. Then I spotted the light fixture and knew immediately I had to frame it into the image. I think it came out great. I couldn’t have asked for a better Sunday. Hanging out with a good friend (thanks Mark! ), capturing some great images of a beautiful location and ending it all with a birthday party for my little sister. Happy Birthday Debbie!! What a cool picture. I really like this one. Well done. I love the colors. You really have a good eye. Thanks Tim! The colors did turn out nice. Wow- thanks for the incredible shout-out, Matt! It was great to get to meet the family, hang out and- as you mentioned- chat about “our plans for the future!” And I do recall that photo being taken, and us both being captured by that light fixture amidst the red leaves. Killer shot, man! Hope to catch you again soon! Yeah, it was a good day Mark. Excited for the future for both of us. I know you’ve got some incredible things planned. Let me know if there is any way I can help. Hope to meet up again soon.